Markets continued with its up move on Friday and ended the day with decent gain once again to close at its fresh life time highs. The Markets saw a gap up opening and opened on a better than expected note as it formed its intraday high of 8866.40 in the early minutes of the trade. After such gap up opening, it pared some of its gains in the late morning trade. Thereafter, it spent nearly entire session in a sideways trajectory. It went on to trade in sideways manner and remained in a very narrow trading range. However, the Markets maintained those gains an finally ended the day at 8835.60, posting a decent gain of 74.20 points or 0.85% while it continued to form a higher top and higher bottom on the Daily Bar Charts. The Markets shall open after a long weekend following holiday on account of Republic Day. Speaking purely on technical grounds, the Markets are likely to take some breather as it now trades overbought and have also resisted a rising trend line. However, following developments like QE by ECB, we might see its effect percolate opening session and might see positive opening as well. In either case, it would now become imperative to guard existing profits and positions. The possible resistance levels would be 8866 and 8920 and supports would come in much lower at 8775 and 8710 levels. The RSI—Relative Strength Index on the Daily Chart is 73.4949 and it has reached its highest value in last 14-days which is bullish. However, it now continues to trade “overbought”. No bullish or bearish divergences are seen as well. The Daily MACD remains bullish while it trades above its signal line. On the Weekly Charts, Weekly RSI is 70.5163 and it shows no failure swing. However, the NIFTY has formed a fresh 14-week high but Weekly RSI has not yet and therefore its shows a Bearish Divergence. Further, the Weekly RSI too trades in “Overbought” zone. Weekly MACD continues to remain bearish trading below its signal line. On the derivative front, the NIFTY January futures have a negligible addition of 98,575 shares or 0.44% in Open Interest. We have expiry week, short of one day and therefore the entire week is expected to remain dominated with rollovers. 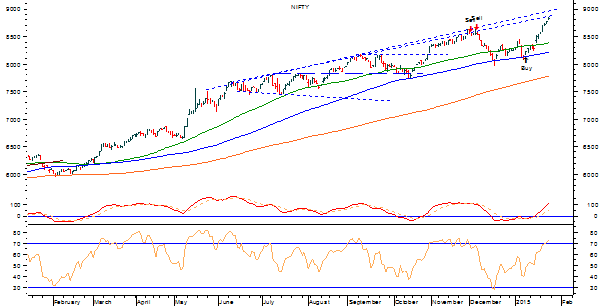 Going by pattern analysis, the Markets have resisted to a rising trend line at 8866 levels. Further, on the Weekly Charts as well, it has resisted a rising trend line resistance. Over and above this, the lead indicators on the Weekly Charts suggest clear possibility of consolidation at higher levels. Overall, reading the technical indicators, on both Daily and Weekly Charts, we can fairly expect the Markets to see minor profit taking at higher levels and consolidate. However, importantly, it can also positively react to developments like QE by ECB and therefore might continue to surge ahead as well. Even if this happens, this rise now should be used to protect profit on existing positions. Fresh purchases should be made with restrain and vigilant protection of existing profits is advised for the day.